NASHVILLE, TN (April 8, 2015) – NRA Country artist, Colt Ford, with the help of Remington, will premiere his short film, “Workin’ On,” based on a song from Ford’s 2014 #1 Billboard release, Thanks For Listening, at this year’s NRA 2015 Annual Meetings & Exhibits. 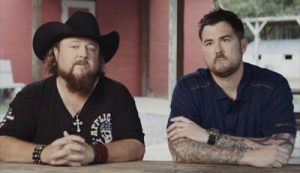 The short film and accompanying PSA was filmed featuring Marcus Luttrell, US Navy SEAL (Retired) to benefit the Lone Survivor Foundation, whose mission is to restore, empower, and renew hope for our wounded service members and their families through health, wellness, and therapeutic support. A special presentation for convention-goers will be made on Friday, April 10 at 3:00 PM at the Remington Country Stage, Exhibit Hall Booth # 1725, featuring appearances by Colt Ford, Marcus Luttrell, Jen Brown from the Lone Survivor Foundation and representatives from Remington. Additionally, later that evening, a public presentation will be made during Ford’s set at the NRA Country Jam V in downtown Nashville, kicking off the NRA 2015 Annual Meetings & Exhibits. Immediately following the presentation at the Remington Country Stage in the Exhibit Hall, Colt Ford is available for interviews to credentialed media. Also, prior to his set at the NRA Country Jam V, at 6:00 PM, Ford will be available for interviews. Prime photo opportunities will take place at 3:20PM at the Remington Country Stage and during his set at the NRA Country Jam V.
For more information about LSF, please visit www.lonesurvivorfoundation.org. In 2012, Colt penned two #1 hits; Jason Aldean’s “Dirt Road Anthem,” and Brantley Gilbert’s, “Country Must Be Country Wide.” His album, Declaration of Independence, topped the Billboard Top Country Albums Chart at #1, and was followed by his new release, Thanks For Listening, in July 2014. Thanks For Listening charted at #1 on Billboard’s Independent Albums, #1 on Billboard’s Rap Albums chart, #2 on Billboard’s Top Country Albums Chart and #10 on The Billboard 200 Albums chart. “Crank It Up! Colt Ford Live At Wild Adventures,” Colt’s first live concert on DVD, was released to retail in Fall 2014 and aired on AXStv in February 2015. To date, Colt has sold over 1 million albums, millions more song downloads, has 1.5 million Facebook Likes and over 100 million YouTube views. Colt was also featured in a two-page cover story in the “Arena” section of the Wall Street Journal (July 2013). In October, 2013, Colt hit the road on a 34-city tour with Florida Georgia Line, and toured with Toby Keith last Fall. In addition to being a gifted songwriter and artist, Colt is also a former professional golfer, and resides with his family in Athens, GA. Follow at www.coltford.com; twitter.com/coltford; facebook.com/coltford. The Lone Survivor Foundation provides support for our wounded service members, their spouses and children by empowering them with helpful techniques and tools addressing Post Traumatic Stress Disorder (PTSD), mild Traumatic Brain Injury (mTBI), Military Sexual Trauma (MST), and pain management. The Lone Survivor Foundation restores, empowers, and renews hope for our wounded service members and their families. The Lone Survivor Foundation is a Federal 501(c)3 non-profit founded in 2010 by US Navy SEAL (Ret.) Marcus Luttrell.